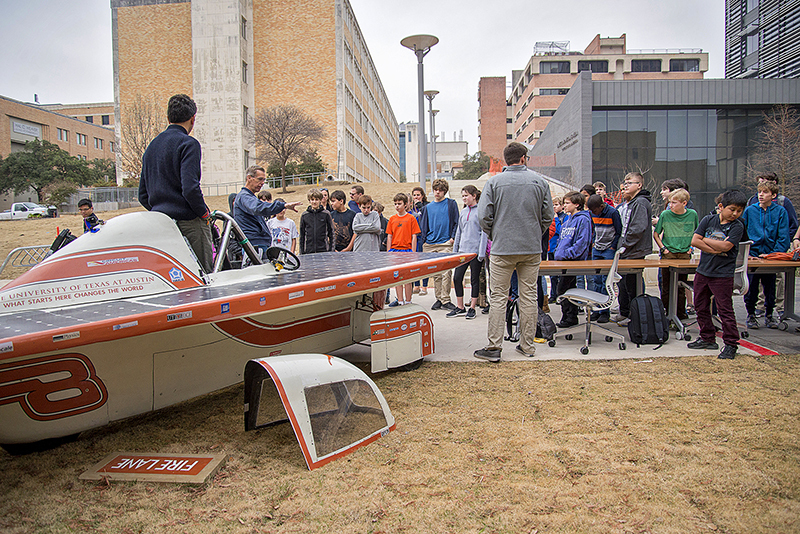 To foster diversity and inspire future generations to consider careers in engineering, the Cockrell School of Engineering hosts events and educational programs for K-12 students and teachers. From the annual Girl Day, featuring hands-on STEM activities that provide thousands of elementary and middle school students with their first glimpse of engineering at work, to our YOUatUT high school recruitment event for underrepresented students, we are working to ensure that every aspiring engineer has an opportunity to pursue an engineering path. In addition to the programs below, Cockrell School hosts on-site visits from schools and classes, connects faculty and student ambassadors with teachers and classes and can provide information for K-12 teachers to share in their classrooms. In a new pilot program developed by Texas Engineering professors, local kindergarten-through-fifth-grade teachers learn new tips and tricks for teaching STEM topics and inspiring excitement among their students. The new Research Experiences for Teachers program invites K-5 educators to the Forty Acres for seven weeks to actively engage with cutting-edge engineering and science research.